First, all OFCCP offices must first schedule any reviews from earlier lists before they can access locations on the new list. If you still have a location that was selected on the 2018 list, this means the review will still be scheduled, and relatively soon! Second, in an FAQ posted on its website, the agency has also made clear it will not schedule any locations from the new list for at least 45 days from its release, or until May 9, 2019. Third, Berkshire believes the above description means that once a district office exhausts its prior list and after the end of the 45-day notice (May 9, 2019) the office can begin to schedule its available randomly sorted compliance checks, CMCE’s, and FAAP reviews. Once those have been scheduled, each office will then move onto its randomly sorted establishment reviews and focused 503 reviews. It is our understanding that OFCCP district offices will offer compliance assistance to companies on the list prior to sending out scheduling letters. We are also looking for additional resources on their website to assist contractors in preparing for a compliance check. Berkshire recommends that all contractors who are on the list ensure they are prepared. 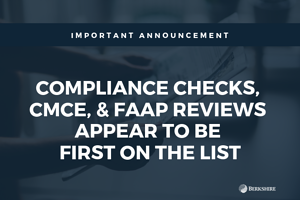 The first group (compliance checks, CMCEs, and FAAPs) only represent 19 percent of the total list, so we are anticipating that most, if not all, OFCCP offices will be in a position to begin scheduling the establishment and Section 503 reviews this summer. Contractors can see if one or more of your establishments are on the list by going to the link at: https://www.dol.gov/ofccp/scheduling/index.html. 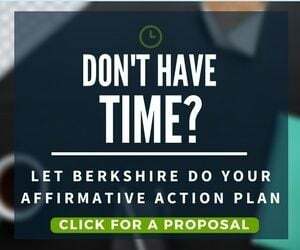 For more information, please contact us at 800.882.8904, bai@berkshireassociates.com, or request more information on affirmative action plans here.